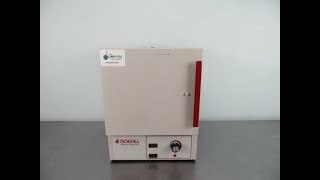 The Boekel 133000 Oven is a small economy gravity convection incubator with digital control. This compact benchtop incubator is an ideal choice for small batches of cultures, warming packs for phlebotomy, incubating assays, heating histology slide and much more. This economy oven has a LCD digital temperature readout, controlled by a knob dial through a temperature range of 5° above ambient to 60°C. The Boekel 133000 Oven has a solid door and takes up a small amount of space with a footprint of 13” x 14” and gives you 0.8cu ft of interior with a single stainless shelf. This Boekel 133000 Oven has been fully inspected and is performing without issue. All of out lab equipment comes backed with our standard warranty. Should you have any questions, please don't hesitate to contact us.